Months after Jeff Wood narrowly and temporarily avoided execution for a murder he didn’t commit, his case has motivated Texas lawmakers on both sides of the aisle to call for death penalty reform. Wood, 43, was convicted in the 1996 murder of Kriss Keeran, who was fatally shot by Wood’s friend in a Kerrville convenience store. Wood was sitting in a truck when his friend, Daniel Reneau, went into the store to steal a safe and then pulled the trigger on Keeran, who worked there as a clerk. Even though Wood didn’t kill Keeran, he was convicted of murder and given the death penalty under the Texas statute known as the “law of parties,” which holds that those involved in a crime resulting in death are equally responsible, even if they weren’t directly involved in the actual killing. He was scheduled to die last August, but, after a rally in front of Gov. Abbott’s mansion and uproar from a group of lawmakers, the Texas Court of Criminal Appeals stayed, or stopped, his execution six days before it happened, sending it back to the trial court to review claims of harmful testimony. With the 2017 legislative session underway, at least two Democrats and a Republican in the Texas House are working to stop Texas counties from sentencing people to death under the law of parties, keeping people like Jeff Wood out of the execution chamber. “We’ve got to start somewhere when it comes to reforming the death penalty, and there’s no better place to start than the law of parties,” said state Rep. Terry Canales, D-Edinburg, about his bill, House Bill 316, which would make those convicted of capital murder under the law of parties ineligible for a death sentence. State Rep. Jeff Leach, R-Plano, who has become heavily involved in Wood’s case, said he plans to file his own bill as well as work with Canales. Leach said he never really took a great interest in the law of parties until Wood’s case came up, and then he immersed himself in it, fighting against Wood’s execution and even planning a trip to meet him in prison next month. “I am strongly in support of us continuing to have the death penalty, but only for the most heinous crimes and offenders that we know actually committed crimes,” said Leach. There are two pieces to Texas’ law of parties. The first puts criminal responsibility on those who help commit a crime, even if they aren’t directly involved — think of the getaway driver in a robbery. The second states that all parties are responsible for one felony that stems from another if the second could have been “anticipated.” So, in Wood’s case, he was participating in a robbery that turned into a murder, and the jury determined he could have “anticipated” the murder based on the robbery. 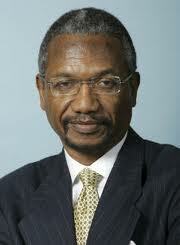 Aside from the new interest, there is Rep. Harold Dutton, D-Houston. He has filed a bill similar to Canales’ legislation every session since 2009, along with one to abolish the death penalty. But Dutton’s bill is more limited. House Bill 147 focuses only on the second section of the law of parties. It would make the death penalty ineligible for people like Wood, who was involved in a murder that stemmed from a robbery, even if he anticipated the robbery may turn to murder. But it wouldn’t touch on those who are convicted for helping the killer commit the murder. Texas is one of six states that has executed people who did not actually commit the murder in which they were convicted, according to the Death Penalty Information Center. The center has confirmed five such executions in Texas, and five other states have each had one. Amanda Marzullo with the Texas Defender Service, a group of death penalty defense lawyers, said that difference highlights the disproportionality of the justice system. “[The new bills] are important for maintaining the integrity of Texas’ death penalty,” she said. Still, many prosecutors fight to keep the law of parties to give them more options in special cases, said Shannon Edmonds with the Texas District and County Attorneys Association. For example, there’s the “Texas 7,” a group of violent prisoners who escaped and went on a crime spree in 2000 that included the fatal shooting of Irving police Officer Aubrey Hawkins. In that case, all six who were eventually captured — one committed suicide beforehand — were sentenced to death, some under the law of parties. “[Prosecutors] want to have as many tools available to them as possible in some of these heinous cases,” Edmonds said. In a death penalty trial currently undergoing jury selection in Walker County, John Falk is charged with capital murder under the law of parties. According to the Huntsville Item, Falk escaped a Huntsville prison with another inmate in 2007, and the other inmate killed a guard during the escape. Dutton’s previous attempts to reform the law of parties have all failed, with the bills never making it onto the House floor. But he and the other two lawmakers hope the recent publicity in Wood’s case will help their cause. In his efforts to stop Wood’s execution, Leach said he was able to gather signatures from more than 50 legislators from both sides of the political spectrum. “I hope the Legislature’s smart. … Around here, it’s sometimes persistence that matters,” Dutton said. Canales said he anticipates amendments and substitutions to his bill but that he thinks it could ultimately survive the conservative Legislature. Even if a law is passed, Danny Wood, Jeff Wood’s father, has trouble finding solace in it. He advocates for reform of the law of parties, but his biggest concerns remain with his son. “The bummer is, as much as I look forward to [new legislation], we also face the idea and realization that that does nothing against [already sentenced] cases,” he said, which would include his son. The Texas Court of Criminal Appeals has halted the execution of Jeff Wood — a man who never killed anyone — six days before he was set to die by lethal injection. State Rep. Jeff Leach, R-Plano, a staunch conservative, is trying to stop the upcoming execution of Jeff Wood, who was sentenced to death even though he killed no one. 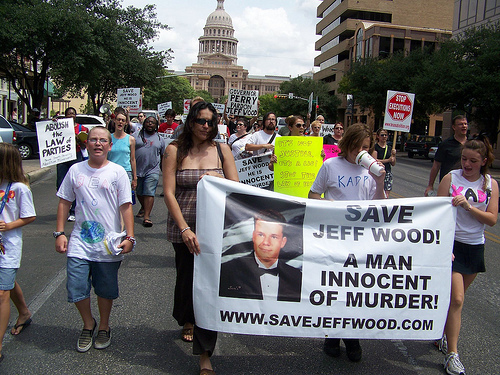 Jeff Wood was outside in a pickup when his partner killed a Kerrville convenience store clerk in 1996, but he was sentenced to death under Texas’ felony murder statute, commonly known as the law of parties. This article originally appeared in The Texas Tribune at https://www.texastribune.org/2017/02/01/texas-lawmakers-seek-reform-death-penalty-those-wh/. State Rep. Terry Canales has filed HB 316, a bill to prohibit death sentences in cases in which the defendant is convicted under the law of parties. Last August 19, Rep. Canales sent a letter to Governor Greg Abbott supporting clemency for Jeff Wood, who was sentenced to death under the law of parties. Before Gov. 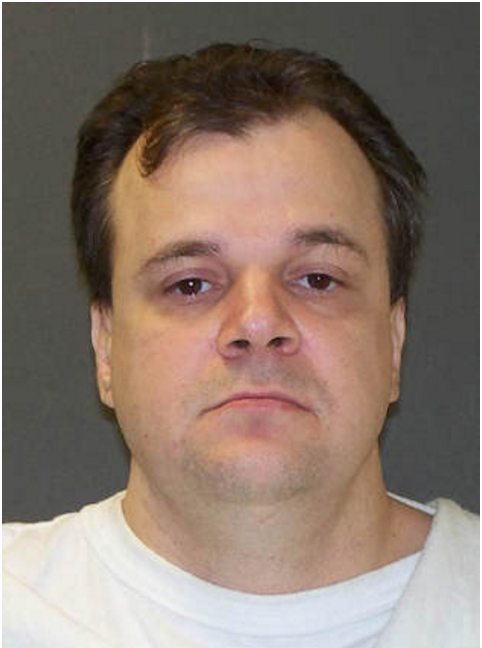 Abbott could act on the clemency request, the Texas Court of Criminal Appeals granted Wood a stay of execution. Wood remains under a death sentence pending further judicial action. the conduct of another in capital felony cases. which the defendant’s liability is based solely on that section. issue [submitted under Subsection (b) of this Article]. submitted under Subsection (b) [of this article]. without parole rather than a death sentence be imposed. sentence the defendant to life imprisonment. SECTION 6. This Act takes effect September 1, 2017. Rep. Harold Dutton of Houston today filed HB 147, a bill to prohibit the death penalty for people convicted under the law of parties. Jeff Wood received a stay of execution in August 2016 after many legislators expressed support by writing clemency letters to Gov. Greg Abbott. Wood received a stay of execution from the Texas Court of Criminal Appeals pending further review. State Representative Harold Dutton, who has sponsored a bill in the Legislatures to end the death penalty in law of parties cases, wrote a letter urging Governor Abbott and the Texas Board of Pardons and Paroles to grant clemency to Jeff Wood. His bill was signed by four other state representatives: Senfronia Thompson, Garnet Coleman, Ron Reynolds and Alma Allen. Thank you to each of them for helping to save Jeff Wood. State Rep. Terry Canales wrote this letter in support of clemency for Jeff Wood. 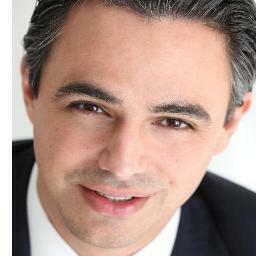 Thank you Rep. Canales! Republican State Rep James White wrote this letter in support of clemency for Jeff Wood. Thank you Rep. White! 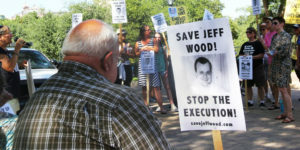 An Unjust Execution Was Scheduled for Today, but Jeff Wood Will Not Die Today. Thank you! Today, August 24, 2016, was scheduled to be the day of Jeff Wood’s unjust execution in Texas. Many people were outraged that Texas sentenced him to death even though he did not kill anyone. His execution has been stayed, but he remains under a sentence of death. His case has been sent back to the trial court for further action. Right now, he remains on death row in the Polunsky Unit. Thank you to everyone who spoke out to stop his execution. Please sign the petition if you have not already done so. We will continue to visit with members of the Texas Legislature to build support for passing a bill in 2017 to prohibit death sentences in law of parties cases. 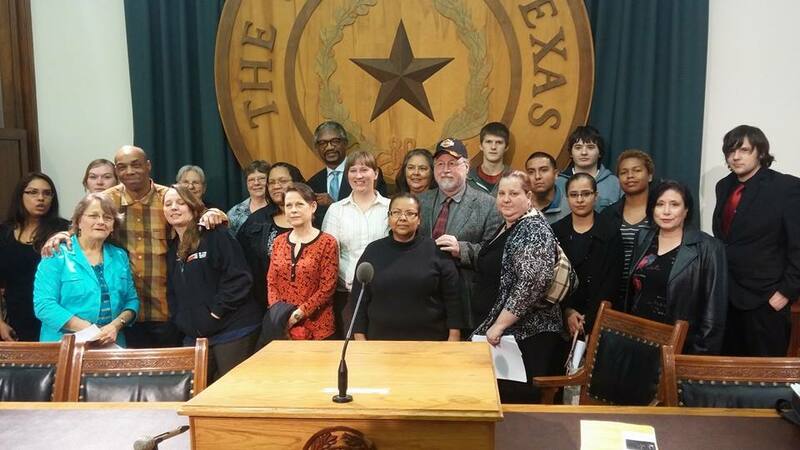 We hope you will join us on Lobby Day in the spring at the Texas Capitol. Photo with Jeff Wood’s family on lobby day in 2015 in support of bill to end death penalty in law of parties cases. We visited all the offices of members of the House Criminal Jurisprudence Committee asking them to support the bill, which did later pass the committee with votes in favor by Rep Jeff Leach, Rep David Simpson, Rep Abel Herrero, and Rep Terry Canales. Also pictured are Rep Harold Dutton in back row, Mark Clements lower left. Terri Been, standing next to Ron Keine, Sabrina Butler left front of Dutton, Gloria Rubac, Lily Hughes, Kidsagainstthedeathpenalty Kadp back row, Delia Perez Meyer, Alison Dieter, Pat Hartwell. Photo by Scott Cobb. Here is a report from the Austin American-Statesman on the successful lobby day, which was widely covered in the media, including the Dallas Morning News. Another office we visited that day was Senator Eddie Lucio, Jr and asked him to file a bill in the Senate to abolish the death penalty, which he filed a couple of weeks later, the first time a state senator had ever filed legislation to completely abolish the death penalty in Texas. We need to collect thousands and thousands of petition signatures and convince as many people as we can to send clemency letters to the Texas Board of Pardons and Paroles and Governor Greg Abbott. In addition to signing the petition, we need as many phone calls, faxes, emails, postcards, and letters to the Governor and the Board of Pardons and Paroles as we can get!!! No fax machine? You can sign up for an account at HelloFax and send free faxes to the Governor and BPP. Tweet the Governor at @GovAbbott. Write a letter to the editor for publication in your local paper. 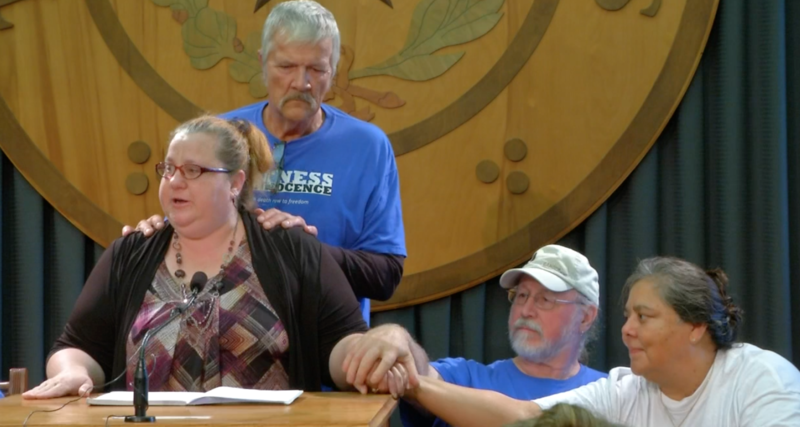 Jeff's family, friends and supporters are organizing a campaign to save him by convincing the Texas Board of Pardons and Paroles and Governor Greg Abbott to grant clemency to Jeff and to commute his death sentence to a lesser term in prison. We need to raise funds to help us with expenses we will incur during the clemency campaign. We are planning rallies and press conferences to convince the public to support clemency for Jeff. We need funds to pay for printing, postage, travel, hosting death row exonerees and others to speak out for Jeff, as well as other unforeseen expenses. Copyright © 2019 Save Jeff Wood. All Rights Reserved. The Arcade Basic Theme by bavotasan.com.